Milker's nodule, first described in the literature in 1799, is a localized, cutaneous, and mostly benign infection caused by a DNA virus of the genus Parapoxvirus. See the image below. Milker’s nodules. Courtesy of Professor Raimo Suhonen and DermNet New Zealand (http://www.dermnetnz.org/assets/Uploads/viral/s/milkers3.jpg). The disease is a zoonosis endemic to and common in cattle worldwide. Infections in cattle are also known as bovine papular stomatitis. Human disease is contracted through direct transmission (ie, handling of infected cow teats, calf muzzles, or other sites of active bovine infection) or through indirect transmission (ie, handling of virally contaminated objects). The course of milker's nodule is usually self-limited, running from 14-72 days, with infrequent systemic symptoms and little or no scarring. Viral replication produces intracytoplasmic inclusions and cytopathic changes in epidermal keratinocytes along with epidermal and dermal reactive changes. The etiologic organism is the milker's nodule virus, also called paravaccinia virus. The milker's nodule virus is a 140 X 310-nm, double-stranded DNA poxvirus, a member of the cylindrical subgroup. Paravaccinia is resistant to desiccation, cold, and heat up to 56°C and can persist in the environment. Under electron microscopy, it is cylindrical with convex ends, and it is covered with a uniform diagonal criss-cross pattern of parallel ropelike structures. On electron microscopy, the DNA core is surrounded by a protein coat, which is wrapped by 2 narrow parallel coats. Mature virus particles are located within keratin fibrils in the stratum corneum. Milker's nodules are caused by a double-stranded DNA virus of the genus Parapoxvirus. Milker's nodule is a zoonosis endemic to and common in cattle worldwide. Human milker's nodules are contracted through direct transmission (ie, handling of infected cow teats, calf muzzles, other sites of active bovine infection) or through indirect transmission (ie, handling of virally contaminated objects). Evidence suggests that milker's nodule virus (traditionally associated with disease contracted from papulonodular lesions on cow teats) and bovine papular stomatitis virus (traditionally isolated from erosive lesions on calf muzzles) may be different though closely related viruses. It seems that they may both cause milker's nodule in humans. In fact, each may cause both types of lesions in cattle. Milker's nodule is an occupational disease, mainly affecting milkers and farm workers caring for dairy cattle, as well as stockyard workers, butchers, and veterinarians. Because infection generally results in immunity, lesions are most commonly seen in persons new to these occupations or in those who have sporadic contact, such as new milkers, pet owners, and veterinary students. The disease is commonly known among agricultural workers to be benign; therefore, it is rarely reported to doctors or other medical personnel in that setting. Sporadic cases and occasional epidemics occur. The prognosis is excellent in milker’s nodules, a self-limited disease that results in little or no scarring. Lymphangitis, lymphadenitis, and fever, which may last from a few days to a few weeks, may occur in milker's nodules patients. Ayhan E, Aktaş H. Dermoscopic features and types of orf and milker's nodule. Postepy Dermatol Alergol. 2017 Aug. 34 (4):357-362. [Medline]. [Full Text]. Tikkanen MK, McInnes CJ, Mercer AA, et al. Recent isolates of parapoxvirus of Finnish reindeer (Rangifer tarandus tarandus) are closely related to bovine pseudocowpox virus. J Gen Virol. 2004 Jun. 85:1413-8. [Medline]. [Full Text]. Hautaniemi M, Ueda N, Tuimala J, Mercer AA, Lahdenperä J, McInnes CJ. The genome of pseudocowpoxvirus: comparison of a reindeer isolate and a reference strain. J Gen Virol. 2010 Jun. 91:1560-76. Lauder IM, Martin B, Martin WB, Nagington J. Milkers' nodule virus infection and its resemblance to orf. Vet Rec. 1966 Jun 25. 78(26):926. [Medline]. Handler NS, Handler MZ, Rubins A, Rubins S, Septe M, Janniger CK, et al. Milker's nodule: an occupational infection and threat to the immunocompromised. J Eur Acad Dermatol Venereol. 2018 Apr. 32 (4):537-541. [Medline]. Wolff, Klaus, Richard Johnson, and Thomas Fitzpatrick. Fitzpatrick's Color Atlas and Synopsis of Clinical Dermatology. 6th Ed. New York, NY: McGraw-Hill Professional; 2009. 768. Taieb A, Guillot M, Carlotti D, Maleville J. Orf and pregnancy. Int J Dermatol. 1988 Jan-Feb. 27(1):31-3. [Medline]. Demiraslan H, Dinc G, Doganay M. An Overwiev of ORF Virus Infection in Humans and Animals. Recent Pat Antiinfect Drug Discov. 2017. 12 (1):21-30. [Medline]. Bolognia J, Jorizzo J, Rapini R, eds. Dermatology. 2nd ed. Spain: Mosby; 2008. Vol. 2: 1231. Schuler G, Hackl JM. [Multiple atypical milker's nodes in scalded areas]. Hautarzt. 1982 Jul. 33(7):388-90. [Medline]. Schuler G, Hönigsmann H, Wolff K. The syndrome of milker's nodules in burn injury: evidence for indirect viral transmission. J Am Acad Dermatol. 1982 Mar. 6(3):334-9. [Medline]. 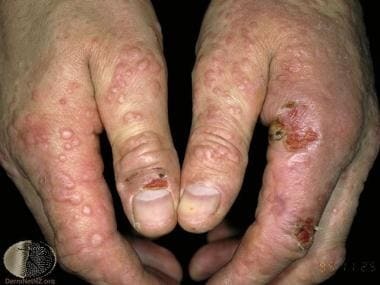 Kuokkanen K, Launis J, Morttinen A. Erythema nodosum and erythema multiforme associated with milker's nodules. Acta Derm Venereol. 1976. 56(1):69-72. [Medline]. Li Y, Meyer H, Zhao H, Damon IK. G+C content based universal PCR assays for poxviruses detection: "Pan_Pox". J Clin Microbiol. 2009 Nov 11. [Medline]. [Full Text]. Davis CM, Musil G, Trochet JA. Electron microscopy for the rapid diagnosis of pseudocowpox and Milker's nodule. Am J Vet Res. 1970 Aug. 31(8):1497-503. [Medline]. Davis CM, Musil G. Milker's nodule. A clinical and electron microscopic report. Arch Dermatol. 1970 Mar. 101(3):305-11. [Medline]. Requena L, Requena C. Histopathology of the more common viral skin infections. Actas Dermosifiliogr. 2010 Apr. 101(3):201-216. Weedon D & Strutton G. Skin Pathology. 2nd Ed. London, England: Churchhill Livingstone; 2002. 461. Shelley WB, Shelley ED. Surgical treatment of farmyard pox. Orf, milker's nodules, bovine papular stomatitis pox. Cutis. 1983 Feb. 31(2):191-2. [Medline]. Ceovic R, Pasic A, Lipozencic J, et al. Milker's nodule--case report. Acta Dermatovenerol Croat. 2007. 15(2):88-91. [Medline]. The authors and editors of Medscape Reference gratefully acknowledge the contributions of previous authors, Gary W. Cole, MD, and Lily L. Tinkle, MD, PhD, to the development and writing of this article.